Community problems escalated within certain Brussels neighbourhoods in September 2009 and at the beginning of 2010. Do subjective feelings of discrimination form a breeding ground for such events? We studied how widely spread the perceptions of discrimination are amongst young 2nd generation Belgians of Turkish and Moroccan origin, which contexts of discrimination are distinguished and who perceives the most discrimination. Is this perception indeed limited to so-called “problem youths”, or are such experiences more widely dispersed within the groups? 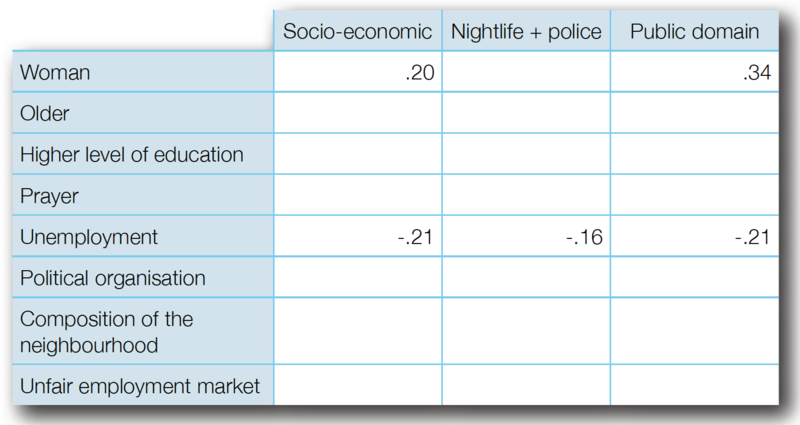 In order to be able to contextualise the situation within the BCR, we compared the same feelings in the same groups within the city of Antwerp. We conclude that the structure of the perceived group discrimination is similar in Brussels and Antwerp for both the 2nd generation Belgians of Moroccan and Turkish origin. There is no difference in the level of experienced group discrimination. 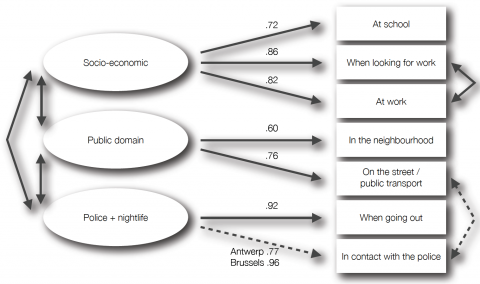 Only the perceived group discrimination within the public domain is higher in Antwerp. The level of perceived group discrimination in contacts with the police is thus not found to be significant in either city. However, confrontations with the police in Brussels do figure more strongly within the latent concept than in Antwerp. In september 2009 en begin 2010 escaleerden samenlevingsproblemen in bepaalde wijken van het Brusselse. Vormen subjectieve gevoelens van discriminatie hiertoe een voedingsbodem? We bestuderen hoe wijd verspreid de percepties van discriminatie zijn bij de Belgische jongeren van Turkse en Marokkaanse origine van de 2e generatie, welke contexten van discriminatie men onderscheidt en wie van hen het meest discriminatie percipieert. Blijft deze perceptie bijvoorbeeld inderdaad beperkt tot de zogenaamde ‘probleemjongeren’, of worden dergelijke ervaringen ruimer gedeeld binnen de groepen? Om de situatie in het BHG te kunnen contextualiseren, vergelijken we met dezelfde gevoelens in dezelfde groepen in de stad Antwerpen. We concluderen dat de structuur van de gepercipieerde groepsdiscriminatie gelijkaardig in Brussel en Antwerpen en dit zowel voor de 2e generatie Belgen van Marokkaanse als Turkse origine. Er is geen verschil in niveau van ervaren groepdiscriminatie. Alleen de gepercipieerde groepsdiscriminatie in de publieke ruimte is hoger in Antwerpen. Het niveau van de gepercipieerde groepsdiscriminatie in de contacten met de politie verschilt dus niet significant in beide onderzochte steden. De confrontaties met de politie nemen in Brussel wel een sterkere plaats in het latente concept dan in Antwerpen. En septembre 2009 et au début de 2010, les problèmes de vie en commun se sont amplifiés dans certains quartiers de Bruxelles. Sont‑ils alimentés par des sentiments subjectifs de discrimination ? Nous étudions l’ampleur de la propagation des perceptions de discrimination chez les jeunes Belges d’origine turque et marocaine de la 2e génération, quels contextes de discrimination on distingue et dans quels groupes la discrimination est le plus ressentie. Par exemple, cette perception est‑elle limitée aux « jeunes à problèmes », ou ces expériences sont‑elles plus largement réparties au sein des groupes ? Pour matérialiser la situation dans la Région de Bruxelles-Capitale, nous effectuons une comparaison avec les mêmes sentiments des mêmes groupes à Anvers. Nous en concluons que la structure de la perception de la discrimination de groupe est similaire à Bruxelles et à Anvers pour les Belges de la 2e génération, tant d’origine marocaine que turque. Il n’y a aucune différence de niveau de la discrimination de groupe éprouvée. Seule celle qui est perçue dans l’espace public est plus forte à Anvers. Le niveau de celle qui est perçue dans les contacts avec la police ne diffère donc pas significativement entre les deux villes étudiées. Les confrontations avec la police occupent une place plus importante dans le concept latent à Bruxelles qu’à Anvers. 1The population of Brussels is extremely diverse. According to estimates, 46% of the entire population has foreign roots (Willaert and Deboosere 2005, p. 68/9). The two largest groups of non-European origin are the Moroccan and the Turkish groups which respectively make up 13% and 4% of the Brussels population. Research conducted by Martens and his colleagues (2005) shows that these are the two groups that find themselves in the bottom strata of the Brussels labour market (based on characteristics such as employment sector, work statute, salary, level of education and length of unemployment). Becoming a Belgian citizen through naturalisation does not offer a solution as the employment conditions for Turkish and Moroccan Belgians remain far below average. It is well known that this problem is not restricted to Brussels. The results of various studies of other places in Belgium point in the same direction: there is a considerable “ethnic gap” both at school and later on the labour market (Phalet, Deboosere, Bastiaenssen 2008, Phalet 2007, Duquet et al. 2006). Furthermore, Phalet (2007) showed that so-called “ethnic penalties” remain after checking for important socio-demographic variables. Other studies employed a more direct quasi-experimental methodology in showing that ethnic discrimination occurs on a regular basis (Zegers de Beijl 2000, Martens et al. 2005). 2The question therefore arises of how this major “objective” inequality translates into the way different ethnic origin groups live together in the city. We know from research that very strong stereotypes exist amongst the population of Belgian origin about both Turks and Moroccans. (Meuleman & Billiet 2005, Elchardus & Siongers 2009, Billiet, Carton & Huys 1990). Several studies have examined the negative attitudes of the “autochthonous” population (Billiet et al. 1990, Elchardus & Siongers 2009) and attempts have been made to establish what mechanisms lie behind these attitudes and who subscribes to them. By contrast, the other side of the coin has barely been discussed by quantitative sociologists. How do minority groups feel under this situation? Do they feel that they are appreciated enough in Belgium? 4The riots were also related to discrimination on the labour market. “Having Moroccan roots is a handicap. I can’t even get a holiday job, for instance […]. Discrimination like this makes me really angry. They just don’t want us to better ourselves” (Droeven, 10/10/2009, p. 30). 5This subjective feeling of discrimination amongst minority groups is the subject of this paper. We will be examining how widely spread these perceptions of discrimination are amongst second generation Belgian youths of Turkish and Moroccan origin, which contexts of discrimination are distinguished and who perceives that they are being discriminated against the most. For example, is it true that this perception is limited to so-called “problem youths” or are such experiences more broadly distributed within the groups? In order to contextualise the situation within the Brussels Capital Region, we will compare the results with the same feelings in the same groups within the city of Antwerp. 7Does Antwerp’s supposed better policing policy also translate to better relations with the police? And what about the experiences of discrimination within Antwerp in general? Although serious riots such as those in Brussels have not actually taken place there for some time now, does this mean that the Turkish and Moroccan youths feel more accepted within the city? We will attempt to offer an answer to these questions in this paper. 8The data that we will be using in this paper comes from the TIES survey of Antwerp and Brussels (Swyngedouw et al. 2008). 9The interviews which are part of the TIES project (The Integration of the European Second generation) were conducted using Computer Assisted Personal Interviewing (CAPI) in 2007/8. The definition of the population that was used in TIES is as follows: residents of the City of Antwerp or the Brussels Capital Region between the age of 18 and 35 who were born in Belgium and have at least one parent who was born in Turkey or Morocco. This definition is therefore independent of nationality. In order to establish a sample in Antwerp, a simple random sample from the entire sample frame was used. The general response rate was 58%. 358 people with at least one parent born in Turkey and 311 people with at least one parent born in Morocco were interviewed. As it was not possible to make use of an entire sample frame in the Brussels Capital Region, a different method of random sampling was used. Street segments were first randomly selected for each of the target groups separately according to the percentage of target group respondents living in each street segment. A commercial supplier of address details was used in order to obtain information on an individual level about who was living at the addresses in the selected street segments (information about age, nationality and name identification)2. A simple random sample of addresses within these street segments was drawn based on this information. In using this technique, we were not entirely sure that the people living at the addresses in the sample actually belonged to the second generation (due to the fact that we did not have access to information about where the parents were born on an individual level). The interviewers therefore had to carry out additional “doorstep” screening before starting the interview. A further disadvantage of using this method is that each address has the same chance of being included in the sample. During the fieldwork, it emerged that more addresses than expected were not able to be used in Brussels. This is probably due to high levels of mobility within the target group population, informality (non-official residence / several households living at one address, etc.) and a lack of quality in the address details that were used (not up to date). It was therefore decided to switch to a semi-quota sample. The principle was that the interviewers still had to visit the start addresses belonging to the original sample at least twice, but if they were unsuccessful, they were allowed to go looking for a respondent with a similar profile in the same street or an adjoining street. Because of the switch to a semi-quota sample, it is not possible to calculate the level of response for Brussels. 250 people with at least one parent who had been born in Turkey and 257 people with at least one parent who had been born in Morocco were interviewed. More details about the research can be found in Swyngedouw et al. (2008). 11Age is operationalised within the TIES research as a dummy variable for which those between the ages of 19 and 25 were given the code 0 and those between 26 and 37 were given the code 1. Education was coded as follows: the value of 0 was assigned to respondents whose highest qualification consisted of a Secondary school diploma (4th grade of Secondary Education included) and also to respondents who were still studying at that level. A value of 1 was assigned to people who had a diploma that had been issued by a college of higher education or university as well as to those still studying at that level. The Prayer variable was operationalised by asking the following question in the survey: “How often do you pray?” Respondents could answer by giving one of the following: never, only on religious holidays, once a week, every day, five times a day or more. Unemployment was split into currently not unemployed (0) and currently unemployed (1). The Political organisation variable is also a dummy variable: 0 indicates that the respondent did not take part over the course of the past year in an activity linked to a student or parent organisation, a political party, an organisation targeting racism or promoting minorities, a socio-educational organisation, a neighbourhood organisation or residents’ association or a women’s organisation. A value of 1 indicates that the respondent did take part in an activity linked to one of these organisations. The Concentration in the neighbourhood variable was measured on the basis of the following question: “If you think about all the people who live in your neighbourhood, how many people are of <Turkish / Moroccan> origin?” Respondents were able to answer with: almost none, less than 25%, around 25%, about half, around 75%, more than 75%, almost everyone. The Justice variable was measured using the question: “Do you think that it is just as difficult, less difficult or more difficult for you to find a good job than people with Belgian origins of the same age and with the same qualifications?”. Respondents were able to answer with: Much less difficult, less difficult, just as difficult, more difficult, much more difficult. 12Unfortunately, due to the fact that the questions are too different, it is not possible to make a direct comparison over time between earlier similar research conducted in 1995 (Swyngedouw, Phalet, Deschouwer, 1999) and the present research from 2007/8 which concerns subjective experienced discrimination in Brussels. 13However, it is possible to make a direct comparison with the present situation in Antwerp as the exact same questions were used in both cities. The results of the average scores can be seen in figure 1. For the time being, we are keeping it to a rough comparison of frequencies. A more rigorous comparison of the level of discrimination in both cities will follow later in this paper: we will statistically test whether or not the latent dimensions of subjective discrimination significantly differ from each other. 14A first striking finding is that the Moroccan second generation experienced more discrimination in all contexts than the Turkish second generation (with the exception of Turks in Antwerp who experience more discrimination in their neighbourhood than the Moroccans in Brussels). It is subsequently clear that, several exceptions aside, all groups perceive more discrimination in Antwerp than in Brussels. The exceptions include the Brussels Moroccan second generation in confrontations with the police and Brussels Moroccans at work. 15If we then take a look at the contexts within which discrimination is perceived, we see that discrimination in nightlife and in looking for a job is often mentioned by all groups. Fewer problems are reported at school and in the neighbourhood. The difference between Antwerp and Brussels amongst both the Turkish and the Moroccan groups is striking when it comes to police discrimination. A much heavier emphasis is placed on this specific context in Brussels than in Antwerp. This difference is particularly noticeable for the Moroccan second generation. 16A first step in our analysis involves finding a suitable measurement model. This is required for two reasons: (1) To prevent measurement errors in the subsequent analysis, it is recommended that multiple indicators are used for each latent variable. In order to be able to compare these, we need an equivalent measurement model for the different groups in Antwerp and Brussels. (2) Secondly, to explore the underlying structure of the concept of subjective discrimination. More specifically, we can ask ourselves whether experiences of discrimination in different contexts can be reduced to a generalised feeling of unfair treatment in society as a whole (a unidimensional model). Alternatively, we can ask ourselves whether experiences are anchored in various, specific life contexts (a multidimensional model). 3 The formal test data can be requested from the authors. 17It is clear from the different statistical tests that we are able to maintain a (quasi) equivalent three dimensional model for Antwerp and also for Brussels. It is therefore safe for comparisons to be made3. 18Figure 2 shows that we were able to level out the structure, apart from three minimal (acceptable) exceptions, for the Moroccan and the Turkish group, both in Antwerp and Brussels. This equivalence indicates strong support for the model that has been found. 19Three separate latent concepts were found: (1) The first refers to the socio-economic dimension and contains the ED (experienced discrimination) indicators at work, when looking for work and at school. (2) The second factor is formed by the ED variables on the street or on public transport and in the neighbourhood. This is ED in the public domain. Contrary to what we had expected, ED when going out to nightclubs cafés and restaurants (nightlife) is not part of this latent factor. (3) By contrast, this latter variable goes together with ED in contact with the police. This association is somewhat more difficult to interpret than the two others. It is our view that this involves a type of discrimination that is mainly levelled at a specific group of (young) men of foreign origin. We call this factor police + nightlife. We were able to level out the factor loading with the exception of one: the relationship of ED in confrontations with the police seems to be more strongly linked to the latent factor in Brussels than in Antwerp, both for the Turkish and the Moroccan groups. The association therefore seems to be stronger in Brussels than in Antwerp. 20It is noticeable that the socio-economic discrimination factor is strongly linked to the public domain discrimination factor as well as to the “nightlife and police” discrimination factor. Socio-economic discrimination clearly therefore supports the other two factors which are linked to a slightly lesser yet still strong degree. 21Finally, we also wanted to compare the averages of both groups in both cities with each other. In order to do this, we had to estimate and subsequently level the intercepts in all groups. This gave models that did not have an optimal fit, but were acceptable enough in our view for establishing the averages. 4 Table available from the authors. 22The results4 show that the Moroccan second generation experience more discrimination within all dimensions than the Turkish second generation, as already predicted from the descriptive data earlier in this paper. This ethnic difference is markedly stronger and more present than the difference between the cities. The only area within which we see a significant difference between Antwerp and Brussels – for both Turks as well as Moroccans – is that there is significantly more discrimination experienced in the public domain in Antwerp than in Brussels. This is the only latent dimension where we see a difference between both cities. 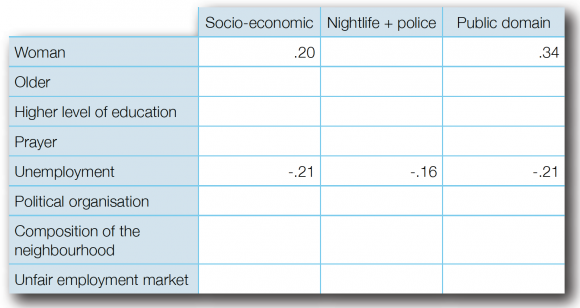 23No level differences were found between the cities for the other dimensions of socio-economic and “nightlife and police”. 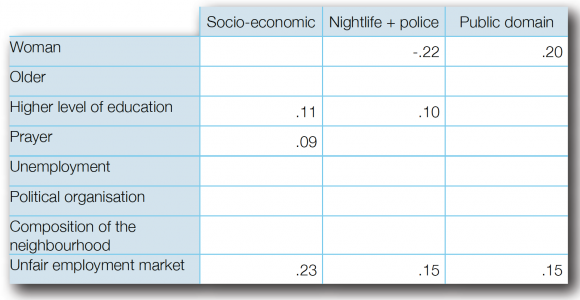 However, we did see earlier that “police” weighs more heavily in Brussels than in Antwerp within the dimension of “nightlife and police”. 24In summary, we are therefore able to state that the Moroccan group experiences most discrimination and that the Moroccan group in Antwerp experience slightly more discrimination in the public domain than the Moroccan group in Brussels. The Turkish group experiences significantly less discrimination than their fellow Moroccan city dwellers but they also experience the same “city difference” as the Moroccan group with more discrimination in the public domain in Antwerp. 25The final part of this analysis consisted of introducing predictors to the model. This enabled us to see which groups feel the most discriminated against. We have two types of predictors: socio-demographic characteristics and perceptual characteristics. The socio-demographic characteristics include gender, age, education, prayer, unemployment and political organisation. The perceptual characteristics are the perception of the number of migrants in the neighbourhood and the perception of justice on the labour market. We hereby wish to emphasise that these perceptual predictors should not be seen as exogenous causes of perceptions of discrimination; they can also be endogenous as they can be the result of earlier experiences of discrimination. 26It is not at all surprising that women perceive less group discrimination when going out and in their contact with the police, but more in the public domain. The higher educated Turkish second generation experience noticeably more discrimination in Antwerp on a socio-economic level and in their contact with the police. Religious Turks see more socio-economic discrimination, and those that feel that they are not treated fairly as a group on the labour market also perceive more discrimination within all three dimensions. 27This is somewhat different for the Moroccan second generation in Antwerp. Women feel that Belgians of Moroccan origin are more discriminated against within the socio-economic and public domain dimensions. Those who are unemployed perceive less discrimination on a group level within all three dimensions. The complement of this is obviously that the second generation of Moroccan origin who are employed experience more discrimination on a group level within all three dimensions. We will interpret this later as part of the “integration paradox”. 28Amongst the Moroccan second generation in Brussels, women perceive more socio-economic discrimination and discrimination within the public domain. Those who possess a higher level of education perceive more unfair treatment on a socio-economic level and in their contact with the police and when they go out. Religious Moroccan second generation Brussels residents perceive less group discrimination when going out and in their contact with the police. The more people live in a homogenous ethnic minority neighbourhood, the more they experience group discrimination in the public domain. Finally, the more unjust people view the way in which the employment market works to be, the more group discrimination they perceive within all three dimensions. 29Turkish second generation women in Brussels experience less discrimination than men when they go out and in their contact with the police. 26 to 35 year olds experience more group discrimination when they go out and in their contact with the police than second generation Turks living in Brussels who are between 18 and 25 years old. As for the Moroccan group, those who have a higher level of education perceive more discrimination within all three dimensions. The religious Turkish second generation perceives less group discrimination on a socio-economic level. However, those who view the way in which the labour market works as being unjust once again feel that their group is more excluded on a socio-economic level. 30Several striking observations emerge here. Apart from going out and in their contact with the police, women perceive more group discrimination; it is also noticeable that the employed second generation Moroccans living in Antwerp perceive more group discrimination within the three dimensions; furthermore, it is the highly-educated who perceive the most group discrimination. These observations lead us straight to what has recently been named as the “integration paradox” (Buijs et al. 2006): those who are successful at school are more conscious of the group discrimination that their group are the (reputed) victim of. Taking this one stage further, we could make the same interpretation for the employed, Moroccan second generation in Antwerp. Participation in a sub-domain leads to a greater realisation of discrimination at a group level. The comment needs to be made here that group discrimination is clearly a different concept to individual discrimination, which is reported much less than perceptions of group discrimination. Nevertheless, it is this perception of group discrimination within Belgian society that is of paramount importance for evaluating the quality of society, rather than individual experiences. 31It is also notable that whether or not people are members of political organisations does not have any effect on the perception of group discrimination for either group in both cities. The perception of group discrimination is therefore not the result of any political activism. 32When it comes to the frictions between the second generation and the police, it should be made clear that these are not limited to those who are on the lower rungs of the socio-economic ladder – at least as far as the perception of this at a group level is concerned. The reported problems with the police are even stronger among the highly-educated group. 33The structure of the perceived group discrimination is similar in Brussels and Antwerp. This structure is also similar for the second generation Belgians of Moroccan origin and Turkish origin. There is no difference in the level of experienced group discrimination between Antwerp and Brussels. Only the perceived group discrimination in the public domain is higher in Antwerp. The level of perceived group discrimination through contact with the police does not therefore differ significantly in both cities that were studied. However, the confrontations with the police in Brussels do have a stronger position in the latent concept than in Antwerp. 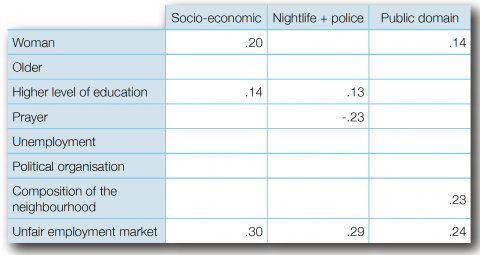 34Our analysis does not contradict the claims which the Mayor of Antwerp made about his police force working efficiently and react on a very short term. Despite the feeling of being less welcome within the public domain in Antwerp, this does not look like it will end up in violent riots (for the time being). In his policy statement, the Minister-President of the Brussels Capital Region, Charles Picqué (PS), also argued for a drastic reorganisation of the police. “The riots in Molenbeek have shown that a debate over the organisation of the Brussels police is essential” (DS. 23.10.09). The events of 2010 and the debate over the police zones in Brussels only serve to confirm this position. The question is not whether the Brussels police need to be reorganised, but how? Efficiency and local involvement, also amongst ethnic minorities, need to be jointly optimized here. 35However, the efficient organisation of the police is only one matter and relates to the curative side of the issue. Reducing feelings of group discrimination within all dimensions and improving the relationship between the police and second generation ethnic minorities is another matter and relates to the preventative side of the issue. When viewed from the preventative side, Antwerp still has much further to go than Brussels. Reducing feelings of discrimination in the public domain means addressing the advantages and the negative behaviour of the white majority with regard to ethnic minorities. 36Returning once more to the question which forms the title of this paper, the answer is that increased feelings of group discrimination in Brussels compared to Antwerp are not responsible for the riots in Brussels. This conclusion does not exclude the possibility of feelings of group discrimination being partly at the root of the events tout court, but that the situation in Brussels is no worse on this level than in Antwerp and that the cause of the riots can therefore not be found within this difference. The fact that riots took place in Brussels but not in Antwerp in 2009 and 2010 can probably not be attributed to a better relationship between the police and second generation Belgians of Turkish and Moroccan origin in Antwerp. Neither can the occurrence of riots in Brussels be explained by a higher perception of group discrimination in Brussels; on the contrary. 37Subjective feelings of group discrimination are not limited to so-called “typical” troublemakers or so-called “problem youths” – young people without any education or work. The problem of discrimination is actually perceived more among other groups of young adults belonging to the second generation: women and the highly-educated. Furthermore, the so-called integration paradox is evident here. This paradox implies that people who, according to the norms, do “better” for themselves (good education and a job), are also more sensitive to phenomena / cases of exclusion and discrimination. 38On the basis of our results we are therefore able to state that it is particularly important to put more of an effort into developing a more positive policy towards ethnic minorities (being pro-active against discrimination and promoting diversity) in society’s “mainstream” institutions such as education, the labour market and the police force. The riots are only the “tip” of the iceberg: the underlying problem of feelings of exclusion and discrimination is widespread and merely using efficient repression will not resolve the problem but only serve to make it invisible. BUIJS, F., DEMANT, F. & HAMDY, A. (2006) Strijders van eigen bodem. Radicale en democratische moslims in Nederland, Amsterdam: Amsterdam University Press. In SLOOTMAN, M. & TILLIE, J. Processen van radicalisering. Waarom sommige Amsterdamse moslims radicaal worden, Amsterdam: Instituut voor Migratie- en Etnische Studies. PHALET, K., DEBOOSERE, P. & BASTIAENSSEN, V. (2008). Old and new inequalities in educational attainment: Ethnic minorities in the Belgian Census 1991‑2001. Ethnicities, 7(3), 390‑415. 1 The TIES survey (The Integration of the European Second generation) was made possible due to financing from: European Collaborative Research Projects in Social Sciences (ECRP) – European Science Foundation; Marie-Curie Research and Training Network ‑ European Commission 6th Framework programme; Scientific Research Fund – Flanders; Prospective Research for Brussels – Brussels Capital Region; Viona – Flemish Ministry of Work and Social Economy; Equal Opportunities Unit – Flemish Minister of Equal Opportunities; IPSoM – H.U.Brussel/K.U.Brussel; CISO vzw – City of Antwerp; Centre for Social and Cultural Psychology and Institute for Social and Political Opinion Research – K.U.Leuven. The article will appear in DE GROOF (R.) (Ed.). Samenleven in een transculturele hoofdstad (1989‑2009) Proceedings from the colloquium held on 11th December 2009 on the occasion of the 20th anniversary of the Brussels Capital Region. Brussels, ASP Editions/Algemeen Rijksarchief. 2 A comparison of the number of supplied addresses per street segment per target group with residential information about the number of target group respondents living in the street segments concerned shows that on average, there is an initial coverage of around 45% for the population of Turkish origin and around 66% for the population of Moroccan origin. Furthermore, additional checks carried out locally by ISPO-K.U.Leuven for the Turkish target group clearly show that 57% of the addresses from the sample also effectively belonged to the second generation of Turkish origin. Véronique Vandezande was a researcher within IPSoM-K.U.Brussels and ISPIO-K.U.Leuven. She has already published: Vandezande, V., Fleischmann, F., Baysu, G., Swyngedouw, M., Phalet, K. (2009). Ongelijke kansen en ervaren discriminatie in de Turkse en Marokkaanse tweede generatie. CeSO/ISPO Research Report, 2009, No. 11, 106 pp. Leuven: K.U.Leuven. Centre for Sociological Research (CeSO). Karen Phalet is a professor of social psychology at K.U.Leuven. She has already published: Phalet, K. (2007). Down and out: The children of immigrant workers in the Belgian labour market. In: Heath A., Cheung S. (Eds. ), Unequal chances: Immigrants in western labour markets (pp. 143‑180). Oxford:. Oxford University Press. Marc Swyngedouw is full professor of political sociology at K.U.Leuven. He has already published: Rink, N., Phalet, K., Swyngedouw, M. (2009). The effects of immigrant population size, unemployment, and individual characteristics on voting the Vlaams Blok in Flanders 1991‑1999. European Sociological Review, 25 (4), 411‑424.